For project implementation at field level and fundraising. Nearby US Embassy, Kathmandu, Nepal. 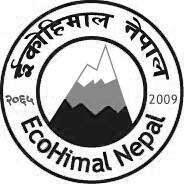 EcoHimal Nepal is a national non-government organization (NGO) founded in 2009 with the goal of achieving sustainable development through community empowerment in Nepal's mountain areas. Having worked in the region since 1992 as the Asia Regional Office of EcoHimal, an international non-government organization (INGO), EcoHimal Nepal have more than two decades of experience in livelihood enhancement through sustainable development and community capacity-building. The organization is well known for improving the living standard of people living in rural areas of Nepal without disturbing its ecology, environment, social and cultural structure by working with grassroots initiatives and in-depth involvement with community groups for developing and implementing projects. EcoHimal Nepal has been implementing number of projects in remote and marginalized areas of Nepal through integrated and participatory approach. Most infrastructure developments are achieved with voluntary labour contribution of local communities that creates sense of ownership of the project, while advocating community engagement in taking collective actions for healthier and inclusive societies. “Participation - Ownership - sustainability” is the main theme of this organization. We at EcoHimal Nepal would love to hear from you!